Altarpieces from the Middle Ages are a feature of many churches along the coast of Norway. They are often called Lübeck altarpieces, because it was assumed that the altarpieces were imported to Norway by the Hanseatics from Lübeck. Kristin Kausland's research shows that the ecclesiastical art is more Norwegian than previously thought. 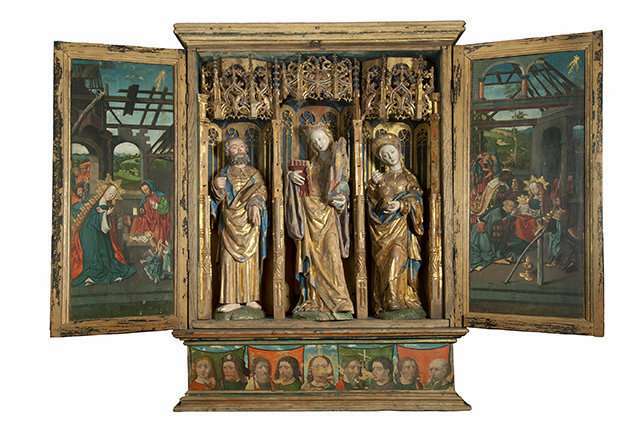 Major parts of the altarpieces were made in Norway, new analyses show. Kausland is a postdoctoral fellow with the Department of Archaeology, Conservation and History and the first person to earn a Ph.D. in conservation at a Norwegian university. While working on her doctoral thesis, she studied more than 60 altarpieces, most of them in Norway and Germany, but also several in Sweden and Denmark. Some of the altarpieces are in museums, others in churches along the Norwegian coast. "Through analyses of even the tiniest paint fragment I have sought to trace the physical prints of the craftsmen and the various production environments under which the objects were created. Call it, if you will, the craftsmen's fingerprints," says Kausland. "In Germany, the craftsmen were organised in guilds. There were strict rules for what was allowed. For example, there were several places where the use of materials other than real gold was not permitted. At that time, churches were very dark. The idea was that these altarpieces should radiate toward you, creating the impression of something holy. They were supposed to shine, and give light," she explains. "In Norway, it appears that people used whatever was the most accessible. Nor were there any established forms of constructional design. It was a somewhat more pragmatic and practical approach, where the craftsmen were probably not governed by guild statutes. Among other things, you could mix different grades of oak," Kausland says. Kausland believes that around ten of the 60 altarpiece she has studied were made in the Netherlands. This is a sensational discovery because almost all the altarpieces in the Netherlands were lost during the Reformation. 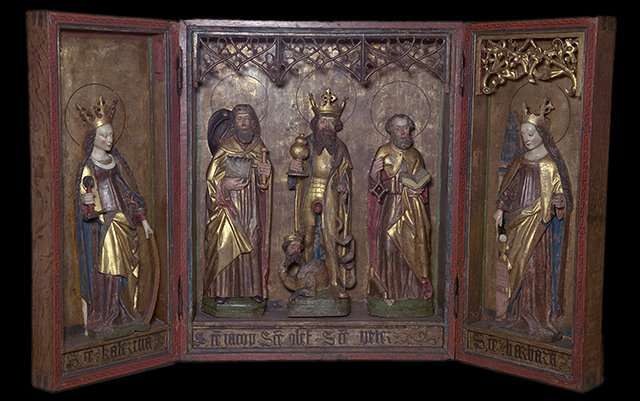 This altarpiece from Austevoll Church is one of the pieces that Kausland believes was made in the Netherlands. What indicates that the piece was made in northern Netherlands are the techniques used in its construction, gilding, sculptures, as well as in the paintings. Credit: Svein Skare, Bergen Historiske museum, Universitetet i Bergen. One of these altarpieces is located in Trondenes Church. Another is from Austevoll, and is at Bergen Museum. There is a high probability that there are more Dutch altarpieces in Norway, Kausland believes. We often look at fine art and forget all the other work that went into it. We concentrate on the paintings and sculptures, but forget that someone made the actual case. The "rough work", that which is not elevated art, is easily forgotten. I am interested in the anonymous craftsmen who have put their souls into an altarpiece and have tried to answer questions about origins, and how these craftsmen collaborated. In the past, it was believed that these Norwegian craft traditions died out during the Black Death. Kristin Kausland's research shows that the traditions continued to live on. Before Christmas last year, Kausland was awarded a mobility grant from the Research Council of Norway. She is now working on a three-year post-doctoral project that will build on her Ph.D. research. She will work at the Hamilton Kerr Institute at the University of Cambridge for the first two years of the post-doctoral period. The postdoctoral project includes fieldwork in Germany, Denmark, Sweden and the Netherlands, where several altarpieces will be put under the researcher's magnifying glass.